MUNICH--(BUSINESS WIRE)--Nov. 13, 2018-- Cypress Semiconductor Corp. (NASDAQ:CY), the embedded solutions leader, today introduced a nonvolatile data-logging solution with ultra-low power consumption. This solution is ideal for the latest-generation portable medical and wearable devices and other Internet of Things (IoT) applications that demand nonvolatile memories to continuously log an increasing amount of user and sensor data while using as little power as possible. Cypress’ new Excelon™ LP Ferroelectric Random Access Memory (F-RAM™) is the industry’s most energy-efficient nonvolatile RAM and delivers instant-write capabilities with virtually unlimited endurance, enabling these applications to perform mission-critical data logging requirements while maximizing battery life. The Excelon LP series is available in a low-pin-count, small-footprint package that is perfectly suited for space-constrained, portable applications. 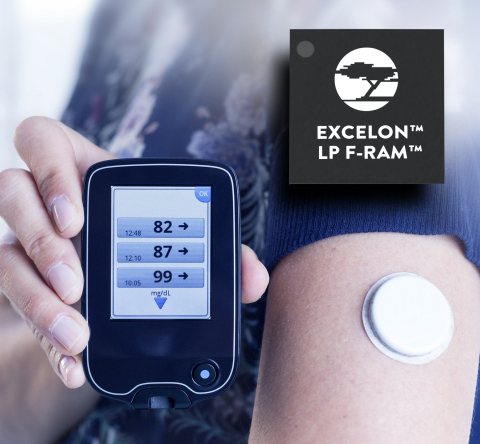 In addition to Excelon LP F-RAM, Cypress’ Excelon F-RAM family also offers high-speed nonvolatile data logging, preventing data-loss even in harsh automotive and industrial operating environments over extreme temperatures. The family includes the Excelon Auto series in 2-Mb and 4-Mb automotive-grade densities and the Excelon Ultra series in 4-Mb and 8-Mb industrial-grade densities. F-RAM is the industry's most energy efficient nonvolatile RAM solution; the F-RAM cell is inherently low power and operates without a charge pump. Cypress F-RAM is an ideal solution for applications requiring high-performance, high-reliability, low-cost nonvolatile memory solutions, including automotive, industrial, medical, computing, networking, smart meter, and multifunction printer applications. More information about Cypress' nonvolatile memory portfolio is available at www.cypress.com/nonvolatile. Cypress and the Cypress logo are registered trademarks and F-RAM and Excelon are trademarks of Cypress Semiconductor Corp. All other trademarks are property of their owners.